Educating and inspiring meeting and event planners free of charge through events, tours, meetings & on line promotions. As a teacher I am at the world famous Greenschool, Bali, where I teach Bambajam as part of the curriculum. Previous roles were at LaSalle College of the Arts teaching jazz on the Degree programme and United world College, Singapore. If I'm not playing piano in a jazz club I can be found turning organisations into orchestras at conferences & events around the world. Over the years I have transformed 10's of thousands of people from the worlds leading organisations into symphony orchestras. I do this to demonstrate that we are inherently collaborative and organisations can learn by simply modelling effective music groups. 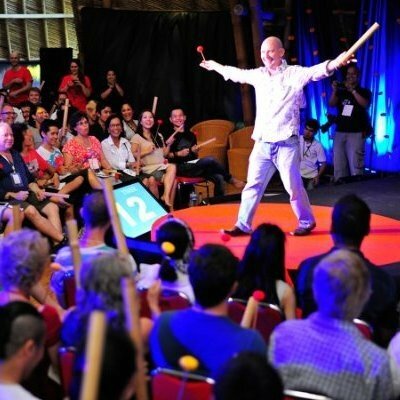 I have spoken at the Worldbank's Global Leadership Forum, Washington D.C., TEDxUBUD and hundreds of conferences around Asia, Europe, ME and The States. In my professional life as a musician I have composed for major television networks including HBO "Next On" music played after every movie thoughout Asia for 4 years. Discovery Channel documentaries and my own perfomance groups. I have shared the stage with Michael Bolton, taught Jamie Cullum and gigged with Dale Barlow (jazz messengers).